The Interview is in 2 parts. You may have to download and/or play on Google Drive. It’s easy! Rogue Phoenix Press has contracted with me to publish my second novel! In 2009, an older Mexican man dies leaving a 122 year old rooming house and 6 diaries to a nephew he barely knew. This intriguing inter-generational and non-DNA family novel contains a cast of characters. From the Polish immigrants who built the place in Chicago’s Back of the Yards neighborhood in 1887, to their son’s and daughter-in-law’s long ownership with 10 children, to a teen age boy who shows up from France and informs the owner that he is his son from an affair at the end of WWI. Then there’s the 19-year old pregnant woman kicked out of her home who moves in, births the baby in the owners bed, and resides in the rooming house with her daughter for 15 years. The two were even given a certificate of adoption printed on a brown paper bag. A diary is discovered written in the 1890’s by the original owners wife which details her secret life of white slavery and meeting her husband working in the baths, plus another huge admission that would have profoundly affected the family–had they known back then. Finally, a young man with a disabled arm who is from the streets of Tijuana, MX is given a room, the first Mexican in the white 1950’s neighborhood, he goes on to inherit the rooming house. He has some secrets also. Part historical fiction, it’s a book that sweeps through the demographic and social changes of Chicago’s neighborhood built around the slaughter houses and meat packing plants. But mostly, it’s about family. And life. And love. And secrets. By the way, a sequel is nearly finished! Southeast Wisconsin Festival of Books! Saturday, November 2, 2018 at 10:30 a.m.
How do you persevere when your very existence is overlooked, erased or denied? Who do you love—and how? This panel explores these questions through the fictional work of Bill Mathis, which reimagines disability and gayness as normal, and Brice D. Smith’s historical reclamation of pioneering transgender activist Lou Sullivan, who was told he could not transition into a gay man. A wonderful, thought provoking interview! BELOIT – Bill Mathis’s first novel might be hot off the presses, but what’s found between its covers draws upon a lifetime of experience. Published by Rogue Phoenix Press, the book went on sale on July 8. It’s available on Amazon.com, can be ordered at the Turtle Creek Bookstore and is at www.barnesandnoble.com as an ebook or to be printed upon demand. 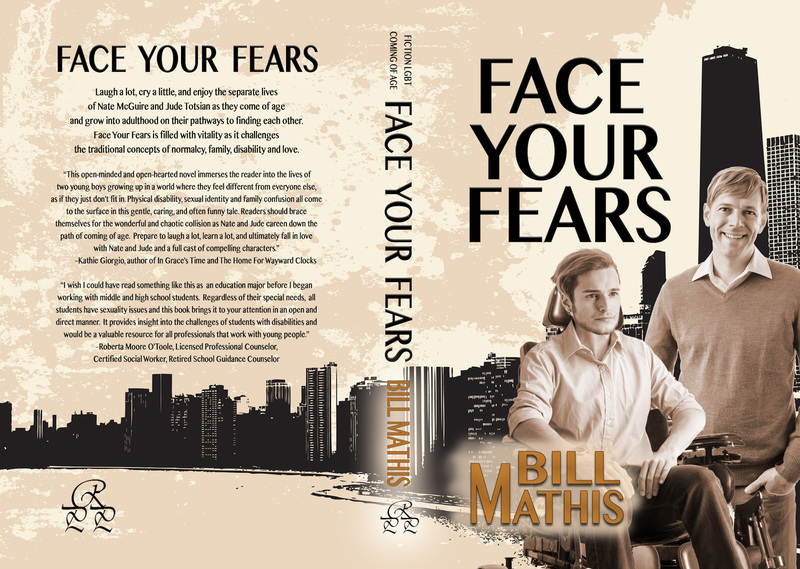 Kathie Giorgio, an award winning author and noted writing coach, will introduce Mathis at the book launch for his new novel, “Face Your Fears,” at 3:30 p.m. on Aug. 4 at the Beloit Public Library, 605 Eclipse Blvd. “Face Your Fears” challenges traditional perceptions of what is normal for a disabled man – a disabled gay man. Nate McGuire has cerebral palsy and is a quadriplegic with use of one hand and his head, which includes, at times, his loud mouth. “The book really questions normalcy and treats disability as normal and from a different perspective,” Mathis said. The other main character is Jude Totsian, a farm kid from a large family in Iowa who has to stay deep in the closet to survive homophobia in the high school and the Air Force. Growing up, he also wonders why he’s the only short, blue-eyed, blond kid in the family. Mathis drew upon the ever winding path of his life for the story’s inspiration. During his career, Mathis worked for 23 years directing YMCA camps, which sometimes included camps for people with vision and hearing impairment, muscular dystrophy, cerebral palsy, cystic fibrosis and other conditions. Mathis recalled taking 70 kids with cerebral palsy to the old White Sox baseball field back in the days of no ADA accessibility. Huffing and puffing, he helped push the wheelchairs around and always remembers some of the lively kids he worked with, particularly a young man he met in 1970 who was a spastic quadriplegic. The feisty youngster would become some of the inspiration behind character Nate. “He was a pistol,” he said. After Mathis left the YMCA camps he helped open a foster care complex, SOS Children’s Villages Illinois. He retired five-and-a-half years ago, met a new man and moved in with him in Beloit. Perhaps because of his conservative and religious upbringing, Mathis didn’t come out as being gay until post-retirement. Mathis had been married and divorced from women twice and raised a family. Today, Mathis said he gets along fine with his second ex-wife and is doing well. He moved to Beloit to be with his partner Rick Dexter and has fallen in love with the city. He began taking writing classes through Society for Learning Unlimited (SLU), where he became hooked with the creative process. Mathis said he was also inspired by author Raymond Luczak, a gay deaf man who has written about his own experiences and put together a queer disability anthology all written by gay men with disabilities. It took Mathis a year-and-a-half to write his first novel and worked with his writing coach Giorgio. He said his main characters Nate and Jude don’t meet up until two-thirds of the way through the book. The earlier chapters chronicle their different upbringing. Jude is a farm kid deep in the closet, while Nate is more feisty in his affluent neighborhood. “Nate gets kicked out of school at age 10 for fighting. He head butts a kid and gives him two black eyes and is mouthy,” Mathis said. Nate’s coming out is pretty easy. “He’s wild. He put rainbow flags on his wheelchair and wheeled around town,” Mathis said. Mathis said disabled people can sometimes be ignored, and he wanted a character who would make his presence known. Nate eventually becomes an art therapist and Jude is a physical therapist. Their paths cross and they fall in love. One of the challenges they encounter is how much Jude “helps” Nate as they try to navigate a unique relationship. Bill’s first novel is published in both print and ebook! by Rogue Phoenix Press! The book is now available in ebook and print on Amazon and Barnes & Noble and may be ordered through local & independent bookstores. 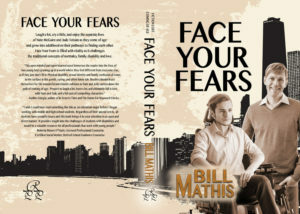 Links to purchase are available on the section titled, Face Your Fears. Want to read some excerpts from the book? Check out Bill’s RiverPath blog posts to entice your interest! Bill will be holding an author event & book signing in LAKE ODESSA, MICHIGAN! Tuesday, October 2, 2018 @5:00 p.m. Check the events section for more info. Bill has been selected to be on an author panel at the Southeast Wisconsin Book Festival, November 2 & 3, 2018 at UW-Waukesha! More info will be posted. Bill received an Honorable Mention for nonfiction and another for humor at the Wisconsin Writers Association annual Jade Ring Contest held October 7, 2017. “It was an honor and a wonderful conference with some great writers and good competition,” Bill said. What is normal? Who defines it? Can a person with cerebral palsy live a normal life? Even if he’s a quadriplegic? And gay? Could someone fall in love with him? If so, who? Nate’s a spastic quadriplegic with good head control, a big mouth and use of his right hand with which he can control a joy stick. He must be fed, bathed and toileted. His affluent parents decide he will not be pitied, nor spoiled. Meanwhile, Jude grows up on a hardscrabble dairy farm in Keokuk County, Iowa. The 6th of 10 children, he’s as comfortable changing diapers, baking a cake, fixing bikes or farm equipment and milking cows as he is playing sports. Yet, something is always nagging at the back of his mind: why is he the only short, blond, blue-eyed one of the bunch; and why does Dad avoid him and only call him boy, never son? Both experience the deaths of teenage loves; both must find their way as gay teens and men, one of them in a wheelchair. Both must find a profession—Jude becomes a physical therapist, Nate an art therapist. Both must navigate relationships, eventually theirs. Humorous, sometimes tragic, Face Your Fears challenges the traditional concepts of being normal. It treats disability as merely different. With accommodations, Nate is simply another boy, a teen ager, an adult, a human, and not exceptionally inspirational. This is not a typical gay romance novel. Instead it brings together the themes of acceptance, family, love, normalcy, disability and LGBTQ+. It confirms everyone has fears. How we face them determines self-acceptance and growth in each of our lives and our own recognition that being different is truly being normal. Bill finished the main draft of his next novel—The Rooming House Diaries: Life, Love & Secrets at 4822 South Justine Street. He hopes to find a publisher in early 2018. He is receiving coaching and editing on it from Kathie Giorgio – All Writers Workshop www.allwritersworkshop.com. In 2009, two Chicago men inherit a rooming house built in 1887 and discover old diaries, letters, photos and ledgers detailing the lives of the Polish immigrants who built the place, their children, grandchildren, and some of the various boarders who stayed there. It’s truly a cast of characters and every one of them seems to have a secret! Some have nefarious backgrounds—white slave trading, an unknown WWI love child who suddenly appears from Paris, an unwed, pregnant teenager, a man with a disfigured arm who survived as a teen prostitute in Tijuana—all find acceptance and a family in the rooming house. It’s rich, funny, at times tragic, and sweeps from Poland in the late 1800’s to Chicago and through the transitions of the Back-of-the-Yards neighborhood. It ends with the opening of the old rooming house as an art gallery in 2012. Bill awaits acceptance or rejection from several journal contests and submissions of fiction and personal essay. He has a trove of fiction and nonfiction short pieces to edit and submit for publication or, someday, combine into a collection.